Pedal-assist bicycles give a boost on the uphills but still require effort. Technically they are not yet legal on New York roads or trails. Photo by Mike Lynch. All e-bikes have electric motors, but most of them still must be pedaled. The motor cuts out when the rider brakes or stops pedaling or if the bike reaches a certain speed. The cyclist is still working, but the motor augments his or her muscle power. — CLASS 1. A pedal-assist bike with motors that generate up to 750 watts of power. The motor cuts out at 20 mph. — CLASS 2. These e-bikes have a throttle and do not need to be pedaled. Again, the motor cuts out at 20 mph. — CLASS 3. These pedal-assist bikes can reach 28 mph before the motor cuts out. Some Class 3 bikes also have throttles. Pedal-assist e-bikes are coming to the Adirondacks. Photo by Mike Lynch. In December, the Adirondack Park Agency authorized the use of Class 1 e-bikes on a proposed rail trail that would extend 34 miles from Lake Placid to Tupper Lake. The state’s original plan to build the trail was blocked by a judge, but the state is taking steps to address the court’s concerns. The rail corridor is not part of the forest preserve. 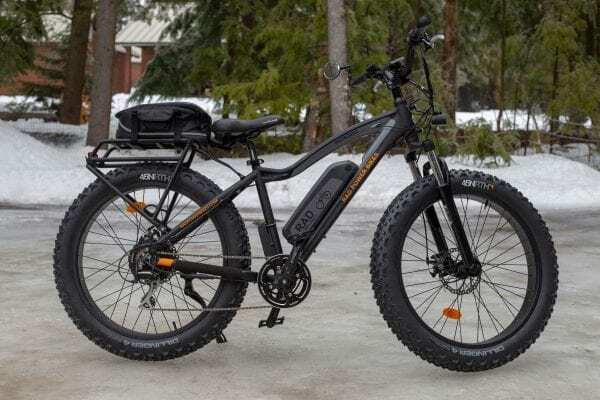 The APA also added a definition of “electric-assisted bicycle” to the Adirondack Park State Land Master Plan that is consistent with the definition of a Class 1 e-bike. The plan says nothing about the other classes. If the state were to open up the forest preserve to e-bikes, they probably would be of the Class 1 variety. Like regular bicycles, e-bikes come in models designed for pavement (road bikes), gravel and dirt roads (hybrids), or trails (mountain bikes). Most of the e-bikes sold in the United States are road bikes or hybrids. A 2018 report by the National Institute for Transportation and Communities says people buy e-bikes for a variety of reasons, such as commuting, running errands, or recreation. Their owners like riding longer distances with less effort, especially on hilly terrain. E-bikes enable aging riders and riders with medical ailments to continue cycling. The survey found most e-bike users are over 45 years old. Nearly a fifth are over 65. Lee Keet is a Saranac Lake resident who for years has regularly cycled a 17-mile loop that takes him out of town and up several steep hills. At 78, with two joint replacements, he decided last summer to purchase an e-bike. He still rides the loop, though now with a little boost from the motor. “You’re still pedaling pretty hard, but you don’t have the feeling that you’re not going to make it to the top of the hill,” he said. After he gets more experience on the e-bike, he hopes to take it on the municipal trails at the Dewey Mountain Recreation Center outside Saranac Lake. “It’s hellishly fun to ride,” he remarked. Keet argues that e-bikes should be regulated as bicycles, not as motor vehicles. “Wherever mountain bikes are allowed, e-bikes should be allowed,” he said. That would include roads and many forest preserve trails. Yet some see the bill as seriously flawed. Fred Monroe, a spokesman for the Adirondack Park Local Government Review Board, noted that a tourist riding an e-bike on a multi-day expedition or a long day trip is likely to pass through a number of towns. “You can’t expect users of e-bikes to know what jurisdiction they’re in on a long trip, much less to have studied the local laws,” he said. 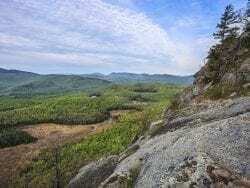 Consider, for example, the scenic 100-mile ride on the roads encircling the High Peaks Wilderness. Whether done in a day or a few days, it’s a tough haul. Presumably, e-bikes would enable more cyclists to undertake the trip. However, the circuit passes through nine towns, three villages, and three counties. If one town or village failed to authorize the use of e-bikes, a rider could not complete the route without breaking the law. There is another problem. Most of the High Peaks circuit is on roads with speed limits above 30 mph. Under Cuomo’s proposal, e-bikes would not be allowed on these roads. Indeed, it would be illegal to ride e-bikes on most roads connecting Adirondack communities. And that would mean the region could not capitalize on e-bike tourism. The Adirondack North Country Association (ANCA) has promoted bicycling for years, touting the region’s quiet roads and natural beauty. Yet, the mountainous landscape can pose a challenge to cyclists. E-bike riders would be able to manage the hills much more easily. Map courtesy of PeopleForBikes, which proposes model legislation across the United States. New York is among the states lacking clear regulations for e-bikes. Vennie-Vollrath organizes ANCA’s annual Bike the Barns tour. The organization wants to allow e-bikers to participate, but this would not be legal under the proposed law, given the highway speed limits. Likewise, e-bikes would not be legal in other long-distance tours, such as the multi-day Cycle Adirondacks and the Adirondack Mountain Club’s Ididaride. Nor would it be lawful to use e-bikes on the many Adirondack bike rides described on ANCA’s website. Most forest preserve lands are classified as wilderness or wild forest. Mountain bikes are prohibited in wilderness but allowed on trails in wild forest areas. Since state law regards e-bikes as motor vehicles, they are not allowed on any trails in the forest preserve. Because of this prohibition, the owners of four Adirondack bicycle shops contacted by the Explorer say they do not stock mountain e-bikes (though they can get them on short notice). They would like the state to make some accommodation for e-bikes on trails. 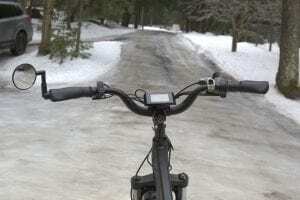 Kenny Boettger, owner of Placid Planet in Lake Placid, suggested “less technical trails” such as old woods roads would be appropriate for e-bikes. “If it opens up the riding experience for more people, I think it’s a good thing, but there should be some regulations and restrictions as to where,” he said. Brian Delaney, owner of High Peaks Cyclery, another Lake Placid shop, agrees that e-bikes should be allowed on some trails. “If it gets people out and having fun and getting exercise, and they’re not degrading the trail, I don’t see it as a big problem,” he said. 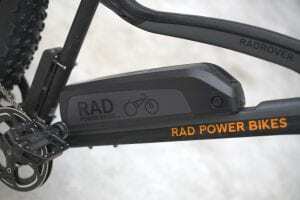 “If a mountain bike is allowed, there should be no reason not to allow a pedal-assist e-bike,” said John Dimon, owner of the Human Power Planet Earth bike shop in Saranac Lake. Proponents of allowing e-bikes on the preserve face an uphill battle. It would require an amendment to the State Land Master Plan, and neither the APA nor DEC favors such a change. What’s more, there would be opposition from the park’s environmental groups. BETA also opposes opening up wild forest areas to e-bikes. One issue is trail damage. Although proponents say e-bikes don’t tear up trails any more than regular mountain bikes do, Wilson says the question has not been sufficiently studied. The bigger issue, though, is the speed of e-bikes and the potential for user conflicts. Twenty miles an hour—the top speed of Class 1 bikes—can be dangerously fast on a narrow trail. And then there’s the annoyance factor. Imagine a rider laboring uphill on a traditional bike being tailgated by an e-biker relying on a motor. “Managing electric bicycles as essentially no different than human-powered bicycles and allowing motorized electric bicycles to operate on non-motorized trails would significantly blur the distinction between mountain biking and motorized recreation,” Wilson said. If e-bikers ride responsibly, however, other riders might not even take notice of them. Thus, Keet contends that Class 1 e-bikes are more akin to bicycles than motorcycles and should be regulated as such. “If you have to pedal it, it’s a bike,” he said. Monroe, of the Local Government Review Board, said the APA and DEC should at least study the pros and cons of opening up trails to e-bikes. The Cuomo administration will work with state lawmakers to pass an e-bike bill this legislative session. If the proposal is adopted as written, e-bike use in the Adirondacks will be severely restricted. Riding on many roads, if not most, outside communities would be illegal. You might be able ride within villages and hamlets, but not between them. So where else might you be able to e-bike? Two possibilities are the state’s two toll roads in the Adirondacks—up Whiteface Mountain and Prospect Mountain. The speed limit on both highways is low. Both are more than five miles long, with substantial climbing, so many riders would welcome an electric boost. Forest preserve roads are another idea. The Moose River Plains Wild Forest, for example, has miles of dirt roads that could be open to e-bikes under the proposed law. As for trails, riders of mountain e-bikers could seek out routes on private or municipal lands. Bauer suggests that DEC could work out agreements to permit e-bikes on conservation-easement lands. There are now 780,000 acres of easement lands in the Park, and the state owns recreation rights on most of the land. Whatever happens, Wilson wants DEC to crack down on illegal use of e-bikes on trails in the preserve. 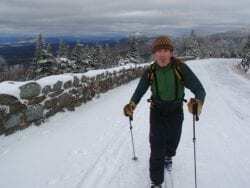 “It is important for land managers in the Adirondack Park to develop signage, educational information, and a management strategy now, before this illegal use of forest preserve lands and trails becomes entrenched and unmanageable,” he said. DEC says it intends to begin a campaign this spring to educate the public about the ban on e-biking in the Forest Preserve. Violators can be fined up to $250 and jailed for up to 15 days. Want more Adirondack news? Sign up for weekly email updates. It does not make any sense to allow regular bicycles on the state highways between communities and not allow e-bikes. If you have to pedal it then its a bike. I see a lot of violations happening to unsuspecting riders and those that will do it anyway. While there may be a trail between Tupper, Saranac Lake and Lake Placid; there is no trail for e-bikes between Cranberry Lake and Tupper or Long Lake and Tupper, both nice rides but pretty hilly. Why discourage bicycle transportation between towns and Villages. Makes no sense. Ebikes should be allowed on trails. Many of us that have ebikes do not want to ride on dirt roads as we are mountain bikers. As far as “less challenging’ trails, that is fine for people new to the sport but not for experienced mountain bikers. I live out west and many mountain bikers are riding ebikes now. Many pros use class 1 ebikes for training and there are countless reasons why ebikes should have the same rules as regular mountain bikes. I live out west 9 months out of the year and in Lake Placid for 3 months each year. Thinking I will have to leave my ebike out west until NY State catches up with Europe and the west coast. Ebikes do not belong in the Forest Preserve. If allowed I can see our already overworked rangers getting calls because an ebike battery died and the user is to “tired” to pedal on under his/her own power. Allowing ebikes into Forest Preserve will only enable the weak and unprepared. If you are not strong enough to pedal the terrain under human power get some lower granny gears or ride elsewhere. When it comes to the operation (use) and licensing of e-bikes, states and local municipalities are responsible for regulating these products. Exactly how states incorporate e-bikes into their vehicle codes varies greatly across the country. Roughly half of the states have laws permitting the operation of e-bikes on public highways, streets, and in case of a handful of states, multi-use trails and recreation paths. New York State has thus far taken very few measures to regulate the use of e-bikes. In 2002, when federal consumer law was amended to define bicycles with low-power electric motors, the New York State Legislature never enacted a conforming update to state law. Accordingly, electric bicycles are not specifically defined in the NYS Vehicle & Traffic Law, and no specific regulations govern their use on public highways and streets. Basically according to NYS, electric bikes are vehicles that cannot be registered, and therefore they cannot be operated on public roadways. For nearly the past decade, bicycle advocates in New York have pushed for the e-bike “legal limbo” to be resolved. When I worked for the New York Bicycling Coalition, I personally worked on several campaigns to clarify NYS law when it comes to on-road use of electric bicycles for transportation and recreation, to no avail. The ebike industry has invested heavily in lobbying NYS lawmakers to change the laws, to no avail. Bills to amend the vehicle and traffic law in relation to electric bicycles have been debated in the Legislature for at least a decade. The State Senate has passed several different versions of the same bill over the years, but the State Assembly has failed to bring any of those bills to the floor for a vote (most don’t ever make it through the Assembly Transportation Committee). Multiple bills have sought to amend the vehicle and traffic law in relation to the definition of electric assisted bicycles; Establish that certain electric assisted bicycles, as defined, are bicycles,not motor vehicles; and Establish safety and operational criteria for their use. The Governor’s proposal to allow municipalities to regulate e-bike use on local roads is not perfect by any means, but at least it gives local governments some control. The Legislature has completely failed to address the issue of e-bike use on public highways in the state for over a decade. If the state wants to boost statewide economies, they shouldn’t be stifling outdoor recreation by not taking action when new technology presents. Local sales/rentals of eBikes and getting people outdoors should certainly boost economies around the state. Get some common-sense regulations written and let’s go already! 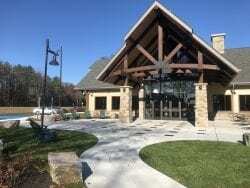 If you are looking to get out on your E-bike, Elizabethtown is studying the challenges related to their use and currently allows all classes of E-bikes on most its Blueberry Trail System (and Class 1 on all trails there). Additionally, Otis Mountain allows Class 1 bikes on a trial basis on all of their trails.